Jim Aloisi is a Boston-based lawyer, historian and transportation policymaker. He is a former Massachusetts state secretary of transportation. His most recent book is The Vidal Lecture. Tanzeel Merchant is a Toronto-based urban designer, architect, planner and writer. He writes for Forbes India. As cities across North American densify, innovate and refocus their priorities, there is a shared acknowledgement that the era of the automobile is over, and other modes of mobility, such as walking, cycling and transit, are in ascendance. However, these changes are constrained by powerful legacies of our past — the existing, auto-centric infrastructure of highways, inequitable transportation funding across modes, and outdated ways of thinking. Times have changed, and our planning and review processes need to change along with them. We now live in an era where young people are choosing not to get drivers’ licenses and buy cars, or are delaying those decisions, and older people are drawn to the virtues of a healthier lifestyle. Despite these trends, many transportation officials continue to shortchange funding for the mobility offered by walking and bicycling. 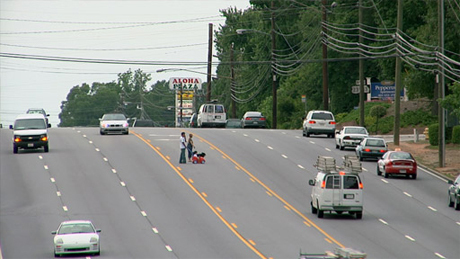 Many streets, especially in new suburban neighborhoods, are not pedestrian friendly. Bicycle routes (if they exist at all) are often poorly designed and unsafe. Equitable funding for these modes of transportation is not, and has never been, a reality. Safe walking and biking ought to be a right, not a privilege. A spate of recent tragedies involving pedestrians and bicyclists points to the urgent need to make mobility safety a critical element of new focus. If you hit a pedestrian at 20 mph, 5 percent will die; at 30 mph, 45 percent will die; at 40 mph, 85 percent will die. Walking and bicycling are also cost-savers for cities. Integrating these modes into street designs comes at a small cost, with huge returns in terms of reduced vehicular congestion, lower emissions, less wear and tear of roads, stronger local economies and more vibrant neighborhoods. Planners and decision-makers need a better approach to ensure active transportation is safe and convenient. We propose requiring public infrastructure and transportation projects to undertake a Safety Impact Review (SIR) as part of the process of permitting projects meeting certain thresholds. An SIR would ensure that desired outcomes are baked into development and infrastructure projects right from the start. The SIR is the safety counterpart to the environmental reviews that emerged as an important outcome of the great citizen activist movements of the 1960s and 70s — movements that pushed back hard on the kind of transportation planning and construction made infamous by New York City’s Cross Bronx Expressway. Environmental reviews entail the examination of transportation projects’ effects on air quality, wetlands and open space. For those who think this will add to costs and red tape, we would point to the unacceptably high costs of inaction — bodily injury and death, the costs of litigation, and the loss of economic growth (expressed as both private sector investment and housing values). Pedestrian- and bicycle-friendly neighborhoods score higher on all these factors. Political leaders are emerging who are ready to break down the barriers. New York City Mayor Bill de Blasio has made the issue of mobility safety a priority of his new administration, pointing to what he calls an “epidemic of traffic fatalities,” which nearly equaled homicides last year in New York City. DeBlasio’s “Vision Zero” initiative has the goal of eliminating traffic deaths within a decade. He is marshaling the collective efforts of several city agencies, including the police department, asking them to develop a comprehensive plan to tackle bike and pedestrian safety issues. De Blasio is one of many civic leaders who taking on this challenge. The development and use of a Safety Impact Review can help deliver on this promise. By baking a Safety Impact Review into the transportation planning, design and construction process, we can take luck and good intentions out of the equation and establish clear, transparent, achievable and measureable metrics that projects must meet in order to move ahead. Achieving these metrics will ensure a high degree of confidence that public safety and convenience considerations have been vetted thoughtfully as required components of a final permitted project. Such a process will provide a critical boost for modal equity and multi-modal mobility. The era of highway expansion is over. Our future lies in creating a truly multi-modal transportation network — a robust menu of meaningful choices that enable people to pick-and-choose among modes and make walking and bicycling real mobility options. The Safety Impact Review will go a long way in ensuring that the infrastructure we invest in today delivers the kinds of cities we want tomorrow for ourselves and for future generations. Perhaps a good way to define the threshold would be to subject road projects that add capacity for general motor vehicle traffic to the review, and exempt projects that don’t. In my comment to the CA govt about CEQA reform yesterday I wrote something similar. Basically, instead of deciding an acceptable level of throughput/congestion and then trying to design the safest means of achieving those targets, we should flip the paradigm: decide what our safety goals are first, and then design in a way that meets those standards while maximizing throughput and minimizing congestion. Whether your main concern is cars, peds, whatever, by prioritizing overall safety you automatically elevate the interests of vulnerable users. We’ve been overspending on roads for so long that the vast majority of road projects simply don’t improve mobility. Adding another lane to the street in front of my house to take 2 minutes off the rush hour commute means I can no longer safely walk to the corner store but must instead make one more trip in the car. It’s saving 4 minutes of travel at one point in the day at the cost adding 20 minutes of travel to the day overall. An important part of the problem is that politicians have a strong incentive to fund big construction projects and little incentive to fund maintenance and smaller scale improvements. Big construction contracts allow them to send money to their supporters which builds their power base which in turn allows them to keep their office and pursue higher office. Tweaking the placement of traffic lights and turn lanes has a much higher impact for much less money but doesn’t allow for as much graft. support it even in those areas where it wouldn’t impact travel time and it would improve road capacity. * I’m excluding grade seperated highways where no one is suggesting a 20 mph speed limit. They already do safety reviews. Also, what you are describing as an SIR is already part of a more robust analysis, a Health Impact Assessment (HIA), which transportation agencies are reluctant to utilize, erroneously arguing that it duplicates work they are already performing under statutory obligation. Undoubtedly, the same “duplication of work” response would arise in objection to a an SIR proposal. The problem is not that safety reviews are not undertaken, it is that they are undertaken from the perspective of a highway engineer that defines safety in terms of a vehicle user, relies upon so-called safety standards that are also vehicle-oriented, and, for major projects in particular, is guided by a regulatory and project funding structure that is also heavily biased in favor of road-oriented solutions. Everything else — including pedestrian safety — is approached from a mitigation perspective, e.g., the question is not whether added highway entrance and exits ramps are appropriate at a heavily urbanized and highly utilized transit node, but rather a suggestion that there should be a 3X10 island of refuge between those four highway and entrance ramps so people on their way to the train “safely” congregate and stand amidst entering and exiting highway traffic that is trying to beat the traffic light. What matters is speed, volume, and mobility, defined in terms of cars getting from point A to point B faster. Safety is primarily a vehicle crash reduction calculation. As for the proposed SIR, how about simply getting the already existing concept of a Health Impact Statement (HIA) completed for all road expansion or new construction projects. It is more comprehensive than what has been described as a SIR and would be highly complementary – not redundant to – road investment projects, perhaps even suggesting road investments are the wrong investments to make. Too damn easy to convert a bus lane into a general-traffic lane overnight, without actually doing a “project”. I’d therefore subject all road projects to the review. Calif. Leads Nation in Green Transpo Policies. How Does Your State Rank?